Kitchen Storage: Smart storage ideas to declutter and organize your kitchen. Clear the countertops and prep your pantry with these awesome tools for kitchen storage to organize your space. As the hub of every household, the kitchen is a high-traffic area where all of us love to hang out with our family and friends. Unfortunately, the kitchen is also the most likely area for cluttered hotspots. You know those places–where cabinets and countertops become a catch-all for everything from paper piles to castoffs. With a few extra tools, however, you can easily declutter your kitchen to create a beautiful, organized space. Here are 25 tools to organize your kitchen that will transform this living area to the most popular hangout in your house. I love my pantry and, since I have a very small kitchen, I’m thankful that it’s a good size with deep shelving. When we first built our house, however, I didn’t utilize my pantry to its potential. I simply stored everything on the shelves and stacked canned goods and other items as best I could. 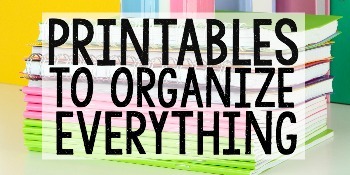 Since then, I’ve discovered lots of cool containers and other organizing tools to clear the clutter. By creating zones within the pantry itself, I’ve been able to create an organized space that keeps everything handy where all my dry goods are visible, so that I can easily keep stock of what I need when I head to the store. 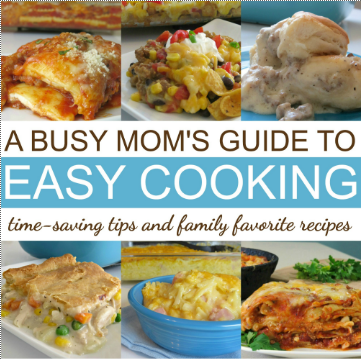 The pantry can quickly become a cluttered closet of groceries and paper products. 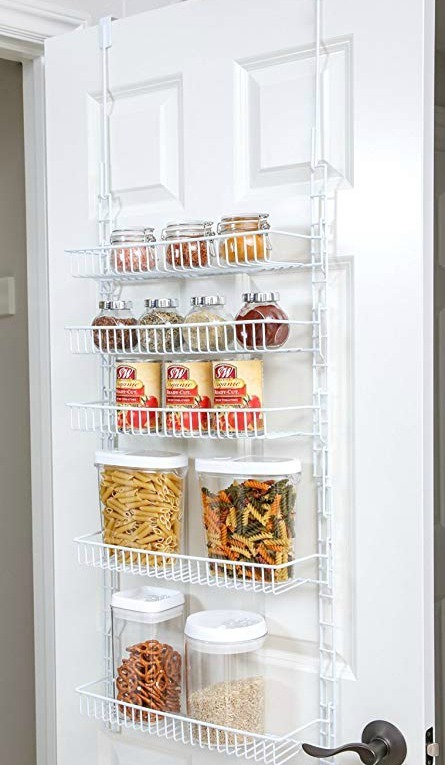 By organizing your pantry, you’ll be able to keep your dry goods fresh and easily accessible. And, with just a few of these tools to get you organized, your pantry will look way cooler, too. Here are a few of my favorites. Create extra storage over the pantry door. Increase storage for your canned goods. 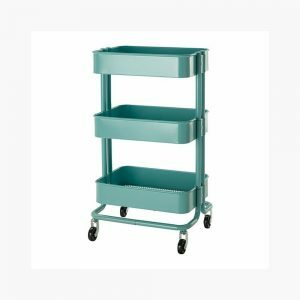 A utility cart adds extra storage and working space. Create new storage under pantry shelving. 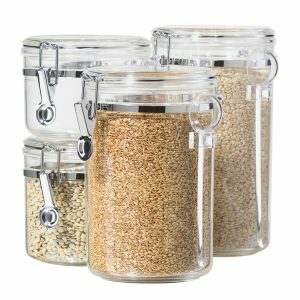 Keep cereals and dry goods fresh longer in these air sealed containers. When we built our house, I had the cabinet guy install a lazy susan in my corner cabinet for spices. I thought it would make things easier. I mean, who doesn’t love a lazy susan? Just spin to find the spice you want. However, my lazy susan soon became a cluttered mess. And, because mine is large and in an upper cabinet, many of my spices fell back into the dark corner of my cabinet never to be discovered again. That’s why I now use other tools to keep my spices handy. The spice rack is probably the most neglected area in your kitchen. However, keeping your spices updated makes a huge difference in your baked goods and everyday cooking. By keeping them neatly shelved and organized, you will use them more frequently, and may even take the opportunity to experiment with new seasoning combinations, too. Make sure to frequently check dates on all those spices and bottles you have stashed at the back of your cabinets and grab one of these simple tools to create a well organized spice rack, too. Store spices on a wall or cabinet door. Use cool bottles and labels to personalize your own. Use pull out drawers to keep spices easily accessible. Use a foam liner to keep spices in an extra drawer. Create sleek and stylish spice storage. Who else hates to open a messy fridge when looking for something to eat? I try to keep my refrigerator well organized for two reasons. One, it looks better and is way more appetizing. 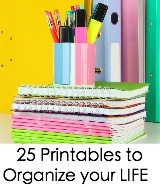 And two, it makes things quick and easy when making my list of items I need when I head out to the store. Keeping your refrigerator clean and organized doesn’t need to be time consuming or complicated. Here are just a few storage ideas that will transform your fridge into a super cool space. Add extra storage under your fridge shelves. These boxes with handles keep things handy. 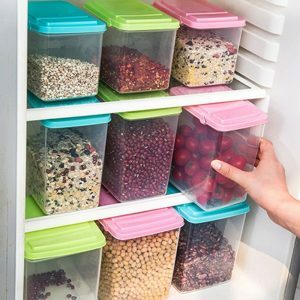 Contain fridge and freezer items in clear containers. Line your shelves with colorful mats that are easy to clean. Get rolling with these convenient storage trays. 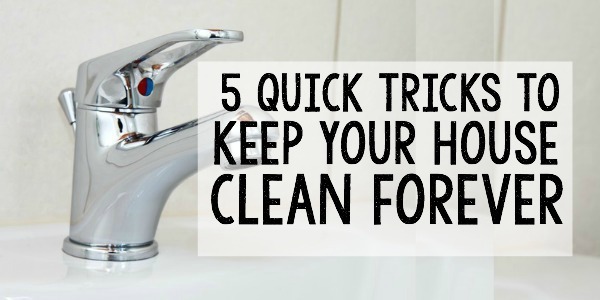 One of my tips in my 5 Quick Tricks to Keep Your House Clean Forever is all about countertop surfaces. It’s one of my pet peeves at the Smith house, and one of those quick tricks that keeps my kitchen feeling tidy and me sane. Clearing your counter space not only keeps housekeeping super easy, but it also makes spending time in your kitchen much more enjoyable for you and your guests. Keeping countertops clear of clutter doesn’t need to be overwhelming or time consuming, either. 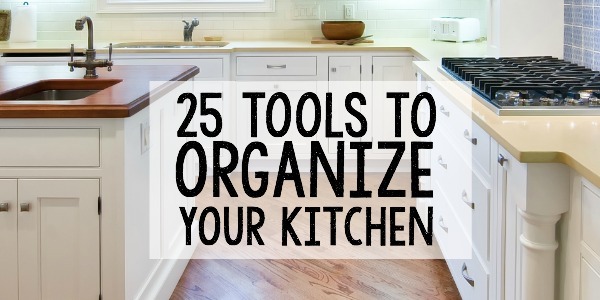 Here are just a few tools to organize your kitchen that will clear your counter space. Glass jars make everything beautiful. 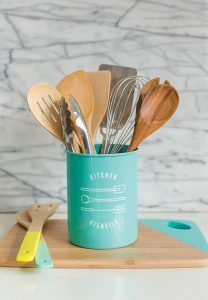 Add a pop of color with colorful utensil containers. Just like countertops, I love clutter-free cabinets, too. Who doesn’t? It’s nice to be able to open your cabinet doors and find the exact casserole dish you need without rummaging through pots and pans. However, with a small kitchen, lots of cabinet storage isn’t an option at my house. 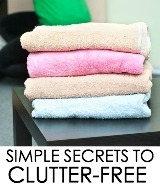 So I have a few quick tools that help declutter my cabinets to better utilize my space. Check out these fun tools to organize your kitchen cabinets. Add extra space in your cabinets. Utilize drawer trays with adjustable dividers. Double cabinet storage with tiered shelving. Pull-out storage organizes those pots and pans. Store cookie sheets and cutting boards on pantry racks. Oh the ideas! 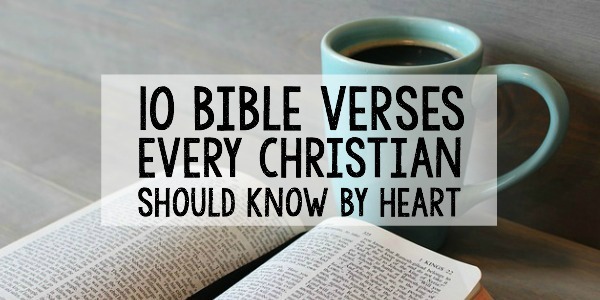 Thank you for this great list. I wish I could hang my pots like that!